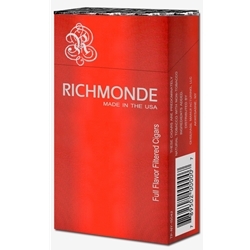 Richmonde Full Flavor Filtered Cigars are available in Box 100's and packaged 20 cigars per pack, 10 packs to a carton for a total of 200 premium filtered cigars. Many filtered cigar manufacturers profit off of offering only mild in strength blends, leaving the fans of full-bodied cigars behind. This, however, is not including the legendary Richmonde blend. All of their cigars are full bodied, offering no compromise in flavor or smoking experience. Call Smokers Discounts and try the Richmonde’s today!